You can create, send and follow up on project-based offers and invoices with InLoox. The chosen budget items will automatically be marked as billed to avoid confusion and double billing. 2. Mark an Actual Expense in the budget list, for which you want to create an invoice (Actual Revenue). If you only want to bill certain budget items, then only choose the relevant budget items. To do so keep the CTRL button pressed while left-clicking on the items you want to include in your invoice. 3. Click on Generate Actual Revenueto create an invoice based on your chosen budget. 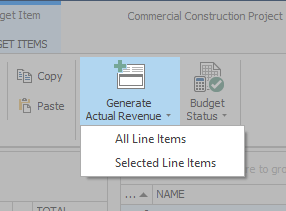 If you want to bill the whole budget, then choose All Line Items in the drop down menu. If you only want to bill the items marked in step 2, then choose Selected Line Items. 4. You find the created bill in the budget list under Actual Revenue and you can edit it in the side panel. Only use the button Generate Actual Revenue for billable budgets, e.g. performed consulting tasks for which you are charging a customer. For deposits for which you did not provide any services, e.g. rent payments, use New Actual Revenue. Generate an invoice - InLoox • Copyright 1999-2019 © InLoox, Inc. All rights reserved.